Team Better Build gathering feedback from Better Build workshop two participants. But this time we’ll also be crowd building ‘wicking’ planter boxes from old shipping pallets. We’re giving two large ones to the the Scouts Association for use outside the Wattle Glen Scout Hall. 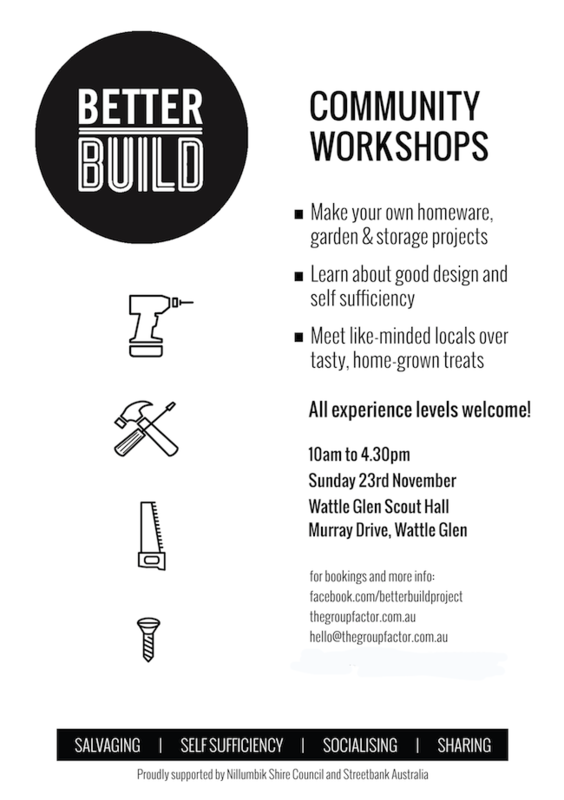 With twenty people in the booked out workshop we definitely need more power tools on hand. So we asked the team at Diamond Valley Mitre Ten if they could sponsor us with a few extra drills and sanders and…they said yes! Nice. 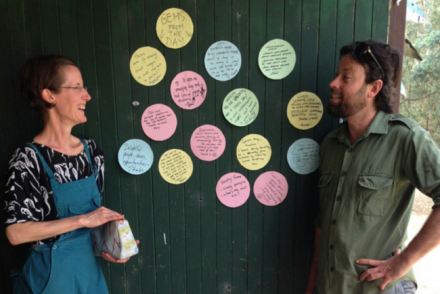 The workshop’s vegetarian lunchtime feast will be supplied by the good folk at Pepper’s Paddock General Store. They’re just 100 metres from the Scout Hall…so local it’s ridiculous. Last but not least, we’ll have extra volunteer facilitators on the day: there’s sustainable builder Paul Pitrone, local permaculture trainer Drew Barr and creative maker Kirk Slywa. All of us are gifting our time to help our novice makers experience the joy of making things by hand. 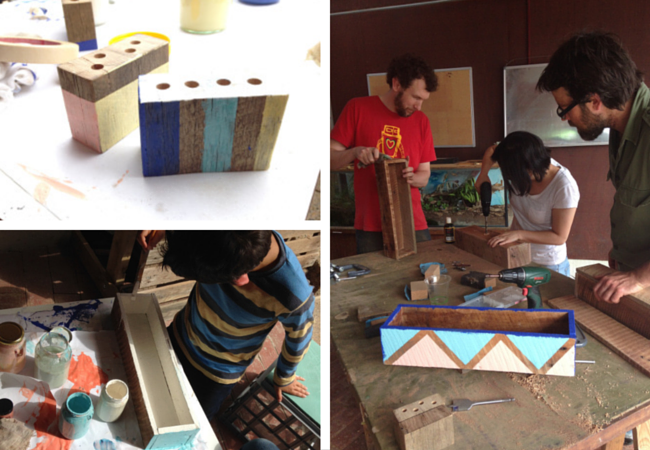 …and other things we learned from staging the first Better Build workshop. 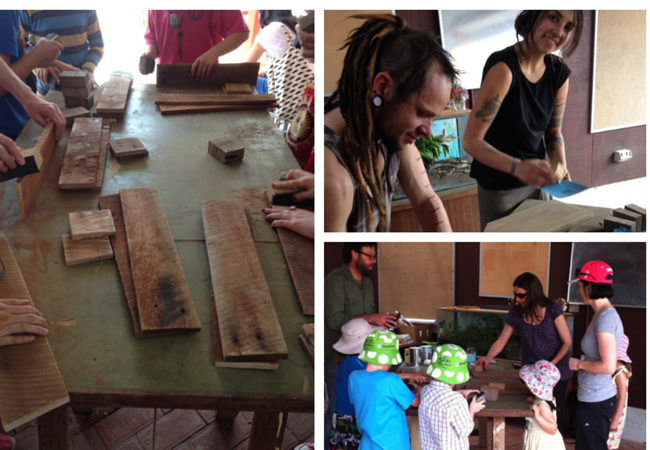 We did it, we got the ‘show on the road’ as part of Nillumbik Shire Council’s Practically Green Festival. Here’s what we learned, how we plan on improving, and some of my favourite shots from the day. Our minimum viable product (a.k.a. the green light) was securing a non-profit space at the Festival. We got this in place about a month out from the event, which meant organising…fast! 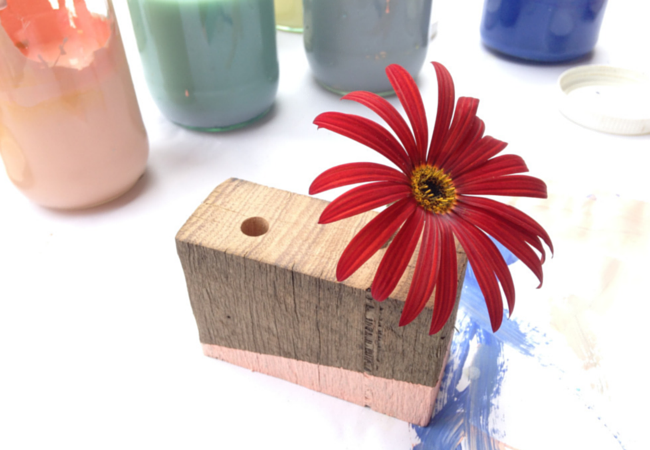 We settled on running two short workshops making simple decorative items from the wood stock we’d already collected. Craig fashioned Better Build signage and an information stand from reclaimed materials. All in one afternoon too (the man is indeed a ‘mover and maker’). 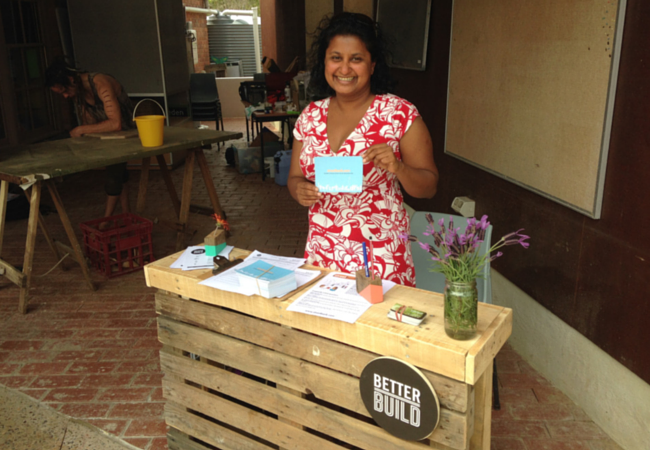 Our meet and greet volunteer from Streetbank, Chamali, behind the handmade workshop info desk. As it turned out my worries were unfounded. We had no problems with people wanting to take part in the workshops – in fact we were a little swamped with interest! We’d planned to work with around ten people (five per workshop). At the end of the day we estimated around thirty people had (safely) tried their hand at making something. Getting people straight onto the job of making things. Don’t sit around talking about it, do it! Having a painting area was gold. This is where projects were personalised and I loved how the kids were so free with their creative expression. 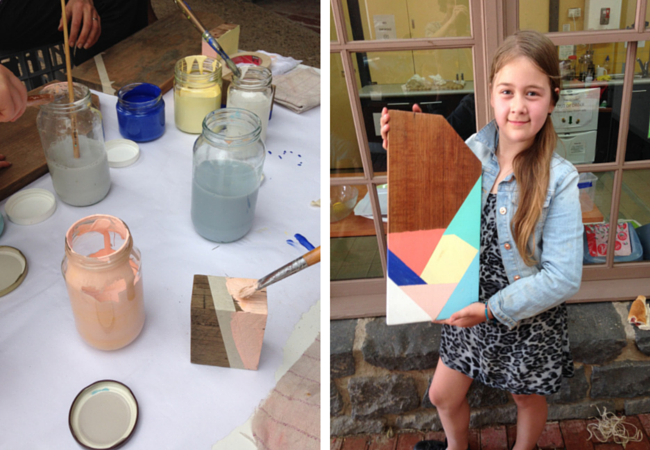 Giving people a chance to try a new skill and take home a finished project – it feels good saying ‘I made this’. Being relaxed and inclusive about people joining in throughout the workshops. A group of people on power tools is like honey to the bees in an interactive Festival like Practically Green. Make sure we have enough facilitators to comfortably host the workshop spaces. With only two of us managing the power drills and painting areas, we were busy all day and didn’t really have time for a break (the rest of Festival passed me by in a blur). Have back up drills to cover a full day of workshops! A few of our patient novice makers had to wait around for the drills to charge before they could finish their masterpieces. Equipment fail = frustration. Overall, such a great way to kickstart this project and test our ideas for Better Build. A day just full of small, satisfying moments.